Investment companies, brokers and even financial advisors have pioneered clever ways to make themselves look far better than they actually are. Recently, in an article in the Journal of Financial Planning, a financial advisor laid out some of the most deceptive practices that he’s run across–practices which, to the untrained eye, can make an ordinary investment company or advice-giver look like a genius. Such as? Suppose an advisor says that he has the rare ability to hand-select terrific investment opportunities for his customers. To prove it, he shares with you the names of the mutual funds and private asset managers that he has in client portfolios today. He shows you their track records, and indeed their long-term returns are impressively above average. Where do you sign? The problem is that you have no way of knowing when he selected these investments. 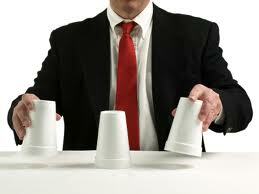 He may have chosen them last week or last month, cherry-picking the best long-term track records he could find. Showing you what he’s invested in today doesn’t tell you what funds he was recommending last year or over the last twenty years. Chances are, any loser investments the advisor has recommended in the past have been weeded out of the portfolio–safely out of your sight. This pitch should tell you to run for the hills. Picking hot funds often leads to disappointment. Hot managers have a tendency to cool off, regress back to the mean (AKA, deliver returns as low as the previous returns were high) and reduce your wealth. Another sly trick you’ve probably seen over and over again is the classic “mountain chart” graph, which shows the total dollar value of $1 invested in an index (often the S&P 500) slinking along the bottom of the page, while the total cumulative value of a dollar invested in the fund, graphed year by year, forms impressive mountains in the sky near the top of the graph. What can possibly be wrong with that? Every mountain chart shows comparative performance over a carefully-selected time period. If a fund had one really good year, chances are that’s what its marketing department will pick as the starting point, because every year thereafter, the fund portfolio will have more money invested in the markets than the benchmark index, so even if it runs about even with the index from there on, or even loses ground, every return it does bring in boosts the total dollar value that much more. Mountains are made out of one-year molehills. The article actually shows an example of this clever trickery, by graphing the S&P 500 index against emerging market stocks over two time periods. The chart at the top shows clearly that emerging markets are the true path to wealth–over a carefully-selected time period starting at the end of 1998. The chart at the bottom looks at more recent data, from the start of 2008 to the end of last year. 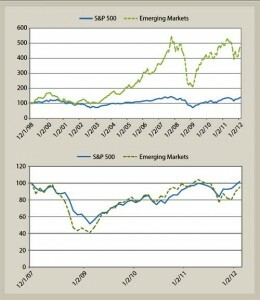 Same two indices as the top chart, but emerging markets don’t look nearly as impressive in the lower graph. There’s a point to this exercise. Whenever somebody implies that he has absolutely crushed the index competition–that he has, in other words, consistently beaten the markets by a considerable margin–you can be pretty sure you’re being deceived. Unless you’re talking to Warren Buffett, who has the clout to make extraordinary deals and the patience of a saint waiting for his bets to pay off, be very skeptical of anything that looks like an extraordinary track record. You may be talking to somebody much closer to Bernie Madoff on the spectrum of advisors than a Warren Buffett.